Why is Hortomallas netting the most efficient bird barrier? A friendly way to keep brids away. Hortomallas net Bird barrier line is specially designed to be the most resistant and economical bird barrier. 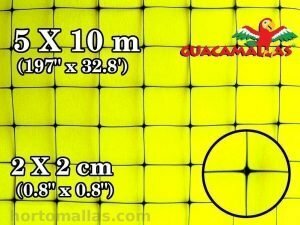 Hortomallas netting meshes sizes are suitable for being an effective bird barrier against urban and agriculture pest birds. Examples of common pest birds are: pigeons, sparrows, gulls, starlings, crows, swallows, grackles, turkey vultures, geese. 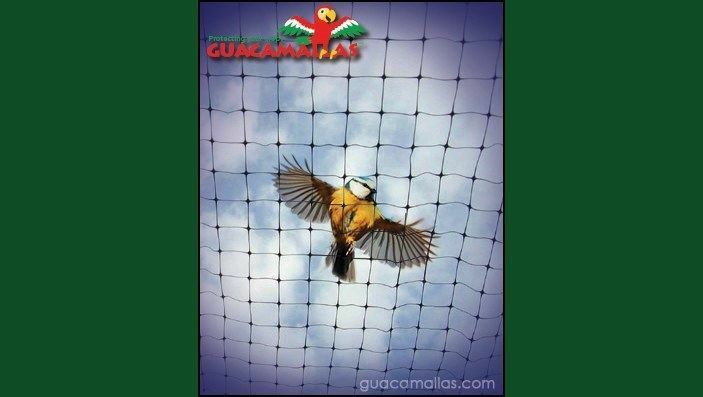 Hortomallas bird net is the ideal solution to get rid of urban pest birds. Pigeons are domesticated birds and they are not afraid of people. As a matter of fact they use to roost and nest always at the same sites. As a result they are invaders and responsible for quickly destroy any property. Most noteworthy their excrements are highly corrosive and actually cause permanent deterioration of even very resistant materials like marble. Pigeons not only cause unaesthetic contamination, they also ruin air conditioning and drainage systems usually situated on the top of buildings. Furthermore their droppings contain bacteria and other parasites that constitute a serious threat for human healthy. Sparrows and starlings are also very common in urban and suburban areas. Because they eat grains, sparrows use to attack warehouses, and food processing plants. All urban pest birds like to nest on roofs, especially in drainage pipes, causing a lot of expenses for repairing. Like pigeons, their excrements are very acid and carriers of more than 60 diseases. Gulls are sea birds, and they live along the coast, lakes and rivers. They are responsible for structural damages at piers and harbours. 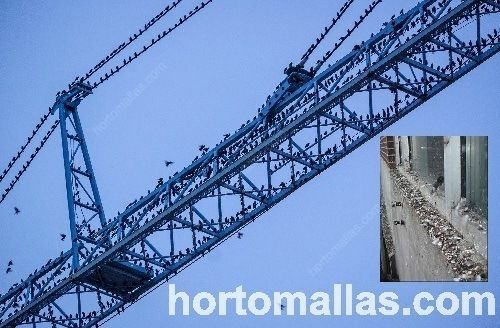 Hortomallas pigeon control net acts as a physical bird barrier. It is the permanent, animal friendly solution for pigeon and pest bird control. Pigeon pest on bridge without bird barrier. Crows eats corn and other crops. They are very intelligent so they quickly get used to acoustic and visual devices. Some common frugivorous birds are: waxwings, toucans, hornbills, cassowaries, bananaquits. Other birds that not only eat fruits but are dangerous for agriculture harvests are: blackbirds, starlings, grackles and magpies, chickadees, quails, geese and pheasants, wild turkeys, woodpeckers, wrens. Fruits usually attacked by frugivorous birds are tree fruits, like apples, grapes, and berries. Birds cause direct losses on harvest production. But also they ruin a lot of fruits, packing them to sip the juice. As a consequence fruits are susceptible to rot away and are not marketable. 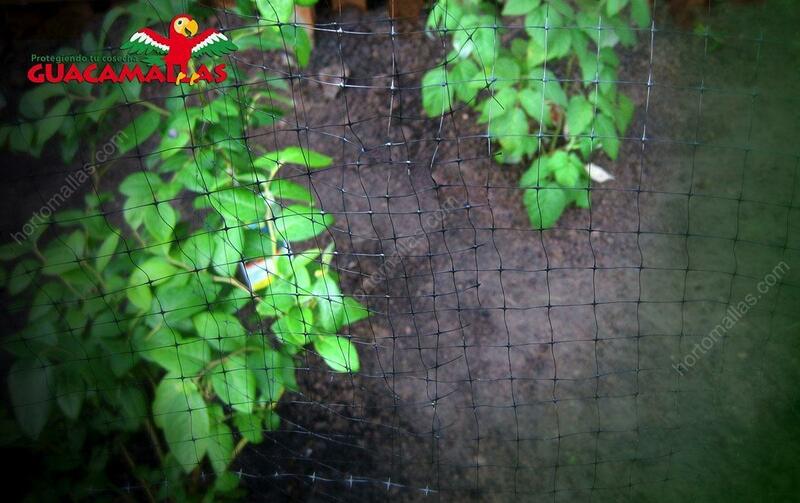 Hortomallas bird control net is easily applied directly over the trees and it can be reusable year after year. 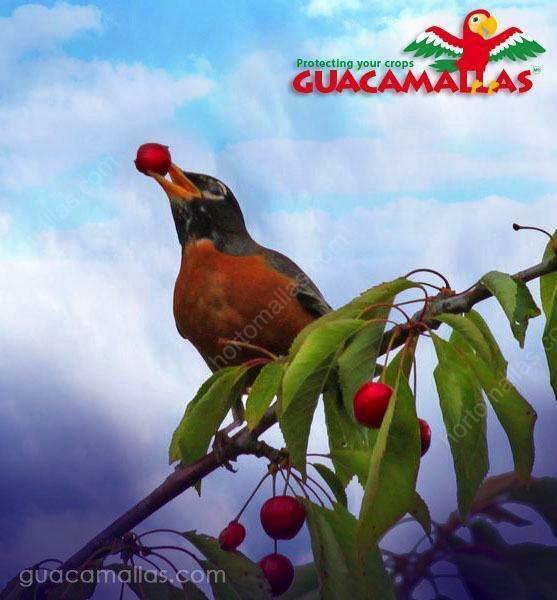 bird eating cherries from a tree not protected by GUACAMALLAS plastic bird net. Netting results the best method to prevent bird damages. In fact it functions as a physical bird barrier and long lasting deterrent. While other systems, like visual and sonic devices that are supposed to scary and keep away the animals are ineffective. In fact birds recognize them as false threats and quickly ignore them. Other deterrents are chemical products. Studies on methods based on ultrasonic sounds reported their low effectiveness after a short period of application. Bird plastic netting are the ideal solution. Bird barrier is the only effective system that prevent the birds from damaging properties and crops. It is not only economical and easy to install but also harmless. Even the Humane Society of the United States (HSUS) recommends the use of bird netting. GUACAMALLAS netting againts pesky birds protecting the next fruit crop.